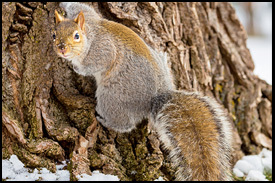 Grey squirrels are the most common squirrel that cause problems for Maine homeowners. These busy squirrels are active the year round and will not hesitate to chew a hole to gain access into a home. They have the potential to have several litters of young squirrels a year. When a squirrel problem is suspected its best to consult a Midcoast Wildlife Specialist to assess the situation. These cute little creatures are very common in Maine and can have several litters of 3-6 young a year. They are active the year round. They can create holes in a building to get shelter. 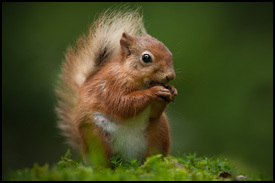 They will be active during the day making most of their sounds during the daylight hours. Contact MWS and we'll tell you how we can make sure these pests don't get into your home. Chipmunks, a member of the squirrel family, don’t usually damage property, but they may injure ornamental plants when they harvest fruits and nuts. Chipmunks will dig up and eat spring flowering bulbs and burrow in flower beds or under sidewalks and porches. Some wildlife control businesses will trap and kill chipmunks. But this isn’t necessary. Consider a more humane approach. Contact Midcoast WIldlife Specialists and we'll help you with your Chipmunk problems. 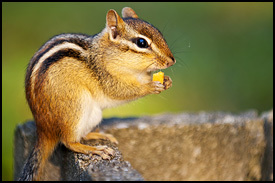 Chipmunks don’t usually damage property, but they may injure ornamental plants when they harvest fruits and nuts. Chipmunks will dig up and eat spring flowering bulbs and burrow in flower beds or under sidewalks and porches. mws is here to help! Gnawing sounds inside an attic or wall is a common complaint. These squirrels are always chewing and will dig into insulation for bedding and nests. Vocalization or squirrel chatter is sometimes heard. They commonly access a tree to gain access to a home's roof but can crawl up the side of a home and use telephone lines to get to the upper level of the house. Some customers will actually see the squirrels entering their home. The common access points on a home are louvered vents, places where the facial wood meets a roof-line, dormer corners areas, vents on a roof and also the ridge vent at the peak of a roof. Removing these culprits usually involves trapping and removing the guilty party from the premises. On some squirrel species you can install one way doors to let them escape to the outside then wire for the opening. But on maine grey squirrels our experience has been that they will chew their way back in. Because this is home to them and they have the powerful jaws and strong teeth to do so. Once all the squirrels have been removed either wiring or sheet metal will be installed over the holes to secure the opening. When a squirrel problem is suspected its best to consult a specialist in wildlife control to access the situation. Wildlife work takes years of experience to become proficient at. It does differ greatly from general pest control work. There are times when mice, birds or bats are actually the problem and not squirrels. That's why Midcoast Wildlife Specialists can access your property and accurately suggest a course of action depending on what we see. Look No Further. Get Started Today With Midcoast Wildlife Specialists. There will be an emergency service charge of $100 before or after normal business hours (7 am to 7 pm). Mileage charges may also apply. Estimates are free within 10 miles and a mileage fee for those over 10 miles away. Any costs will be deducted from exclusion costs if you decide to solve the problem with our services on the same day visit.